Because last weekend delivered absolutely gorgeous weather on Saturday, Dan and I took full advantage by taking a stroll on 30th Avenue in hopes of eating something delicious. There was no shortage of that, certainly, and we had a hard time picking between a few contenders - in the end deciding to try the New York Dog House. The interior of NYDH offers everything I like to see in a restaurant - lots of light, reclaimed furniture, exposed brick walls and varied seating arrangements. While the space is on the narrow side, it doesn't feel that way, as every inch of the restaurant is maximized to its potential. The bar is especially welcoming, sporting a pretty subway tile wall that adorns the restaurant's name in a classic NY subway motif. Aside from the welcoming interior, the outdoor garden is nice too and comfortably sits about 30 people in a quiet, relaxed setting. This is where Dan, Jamil and I positioned ourselves, scoping out a nice sunny table that set the mood for this beautiful day. The brunch menu was one we haven't seen before, as it's not displayed on their website, but it looked great. 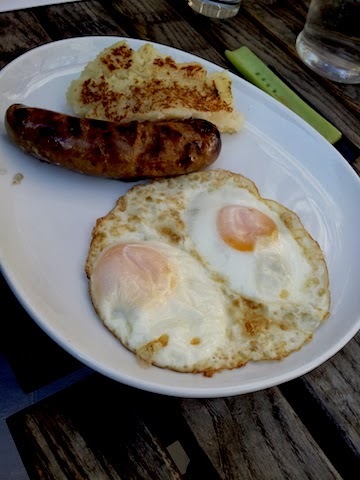 A mixture of eggy dishes as well as traditional dogs, and even burgers, created lots to choose from. Dan, Jamil and I each got something different but the general consensus was very positive. 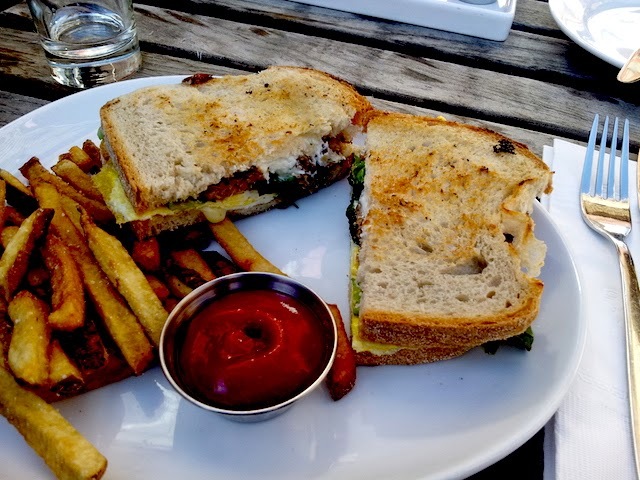 Sausage Grilled Cheese - Sounding like a great combination, it included a layer of sausage of your choice, goat & white cheddar cheese, greens and eggs. I chose the spicy Banh Mi Dog with Asian spices, which paired beautifully with the tangy cheese and sharp greens. The fluffy eggs gave it just the right amount of brunch essence I was looking for. Sausage and Eggs - Dan went a little simpler with brunch by also choosing the Banh Mi dog, alongside a little sliver of homemade polenta and two eggs over easy. While he totally loved everything on the plate, he felt it was a small portion that didn't totally satiate him, and next time he'd probably go for 2 dogs, which was a choice that was offered. Lamb Burger - Going for something a little non-traditional, Jamil got the lamb burger, which looked impressive and got high marks. The general sentiment with this item is that it was cooked well and the fluffy sourdough bun was great too. A side of hand cut fries was a nice complement - we only wished there was more of them to go around. Unfortunately, as is usually the case when sitting outdoors, the service during our brunch left something to be desired. Finding ourselves waiting around for our waters to be refilled and nearly a half hour for our entrees to arrive, I'm hoping this was a fluke. I'll certainly be trying NY Dog House again in the hopes of reversing this experience. 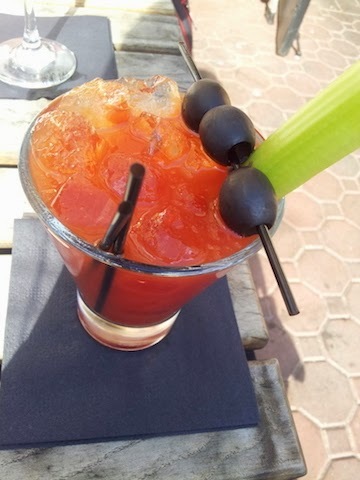 Costs are reasonable for brunch, and all entrees come with a choice of a Bloody Maria, sangria or a mimosa, which is great. Per person, we paid about $15 including tax and tip, which is a good deal.